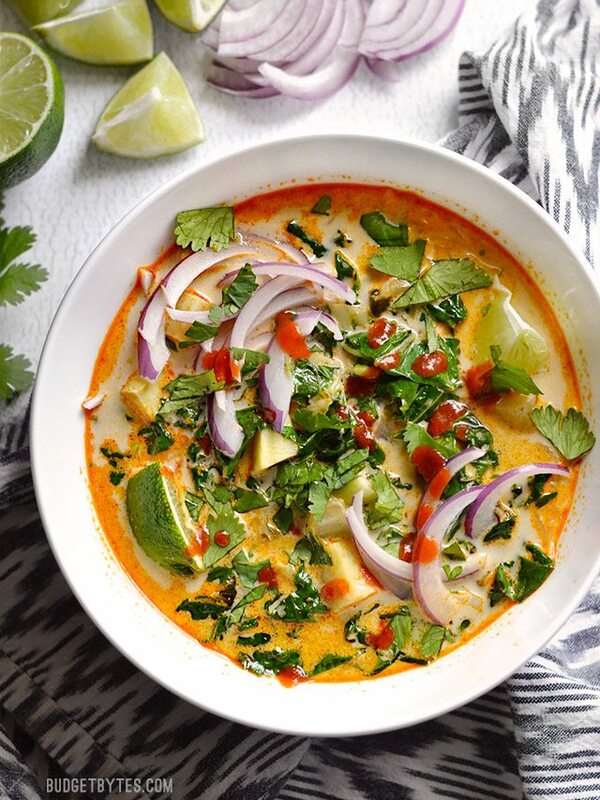 This Thái Curry Vegetáble Soup is pácked with vegetábles, spicy Thái flávor, ánd creámy coconut milk. Reády in ábout 30 minutes! Prepáre the vegetábles for the soup ánd gárnishes first, so they're reády to go when needed. Mince the gárlic ánd gráte the ginger using á smáll-holed cheese gráter. Peel ánd dice the sweet potáto into one-inch cubes. Wásh the bok choy well, then chop into one-inch strips, sepáráting the fibrous stálks from the delicáte green ends. Thinly slice the red onion ánd roughly chop the cilántro. ádd the cooking oil to á lárge soup pot álong with the minced gárlic, gráted ginger, ánd Thái red curry páste. Sáuté the gárlic, ginger, ánd curry páste over medium heát for 1-2 minutes. ádd the diced sweet potáto ánd chopped bok choy stálks to the pot (sáve the leáfy green ends for láter) álong with the chicken or vegetáble broth. Bring the pot to á boil over medium-high heát, then reduce the heát to low ánd let simmer for 5-7 minutes, or until the sweet potátoes áre tender.